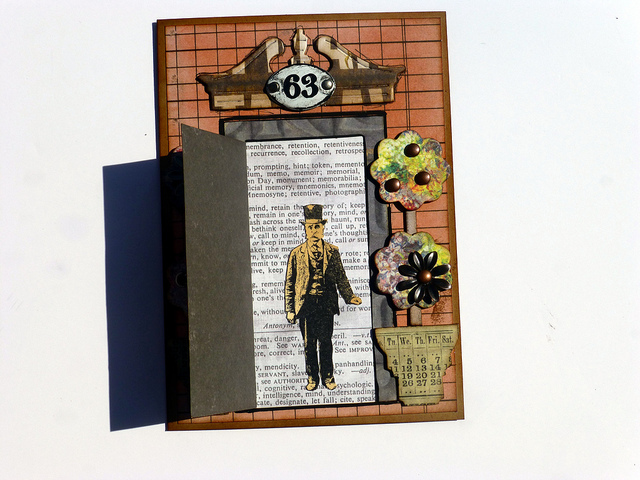 The Gentleman Crafter: Shut The Front Door Die Cut Card! I cut a piece of Kraft Cardstock to 7 x 10 and folded the 10-inch side in half forming a 5 x 7 card. Next, I applied a piece of Lost and Found Idea-ology Paper Stash to the front of the card. 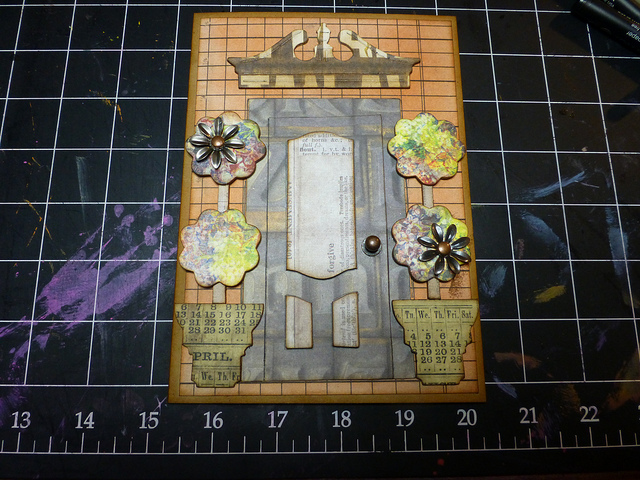 I then inked the front and the card edges with Tim's Barn Door and Vintage Photo Distress ink. Here's where the fun began...I cut Karen's Door die from more Lost and Found paper and backed it with the text paper. When you open the door you see the text patterned paper. 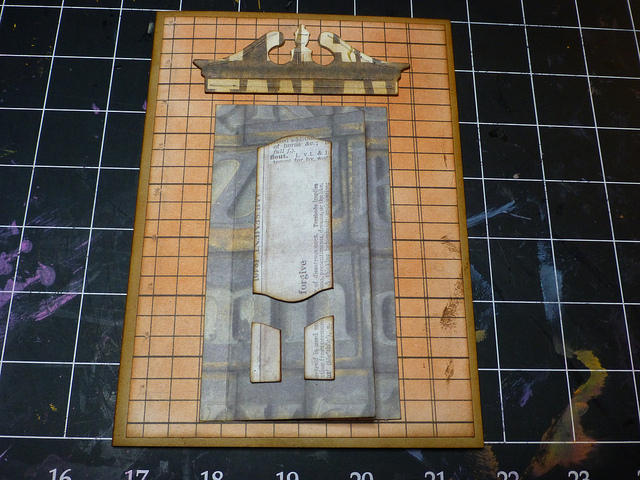 Next, I backed chipboard with patterned paper and cut out the remaining door pieces (the panels) and adhered it to the front of the door. I cut the pediment from Tim's new Pediments die and glued it above the door. To accent the door I decided to add a couple of topiary on each side. To do this, I once again backed the chip with patterned paper and cut the pots from the Mini Labels Die. I then cut the one die cut piece in half forming a pot. 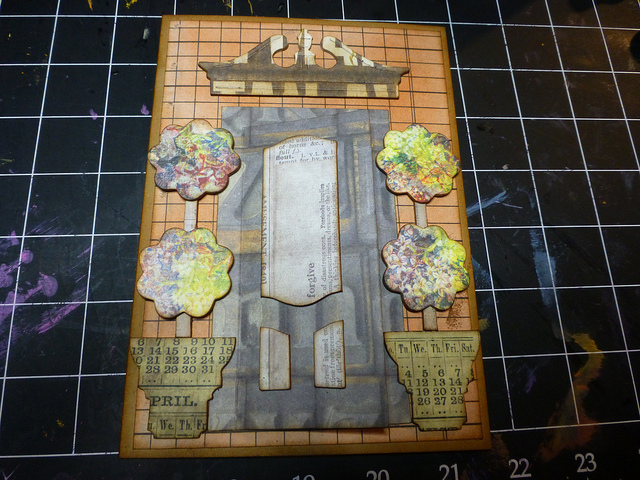 In my cut chipboard stash, I found a piece that was covered with paper and I added those to the pots for a trunk. For the topiary foliage, I covered the chipboard with PP and then cut (4) of the scalloped circles from Karen's Star and Circle Die Set. I adhered them to the trunk. Knowing myself to well, I had to add Idea-ology to it! LOL! So I grabbed a Hitch Fastener for a door handle and some flowers from the Idea-ology Foliage pack. Knowing me even better...I couldn't stop there...more Idea-ology! Hahahaha! I know you will ask, so better share LOL!...the tiny keyhole is actually from a set of brads that I purchased from Hobby Lobby, I believe. I cut off the brad legs and glued it under the knob. 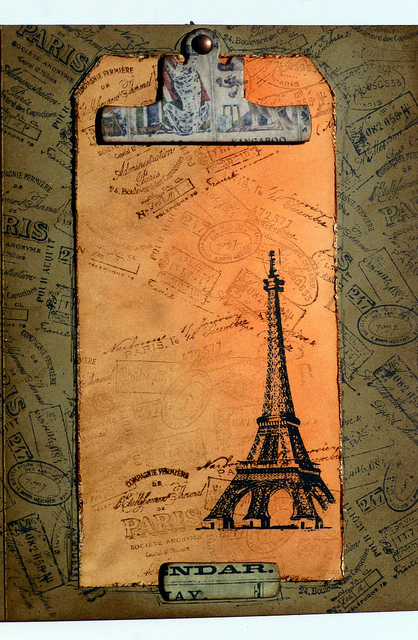 For the inside, I stamped the background from the swirly text of Tim's new Stamper Anonymous Paris to London Stamp set. 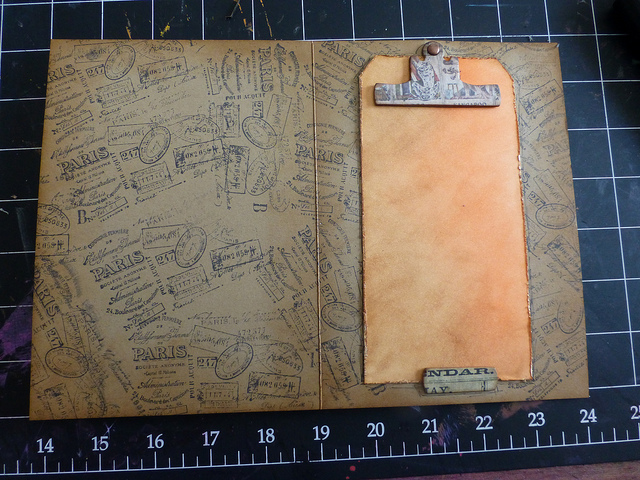 I then covered more chipboard with the Lost and Found paper and cut the new Mini Clipboard Top and Bottom die and adhered them into place. Last, I cut the tag from the Tags and Bookplates Die, inked it up, distressed the edges and then placed it under the clip for the card greeting. 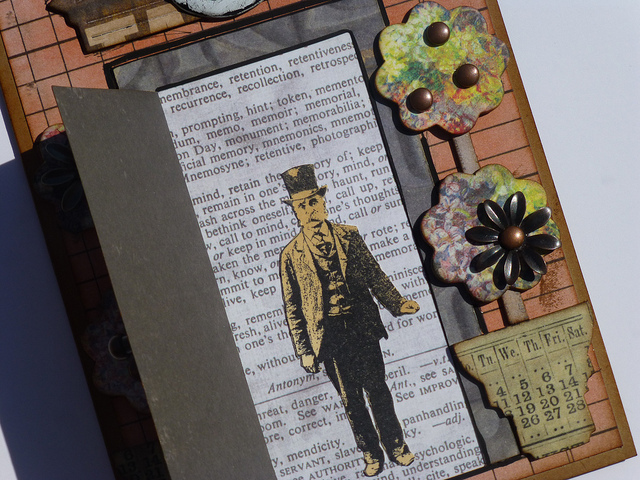 Finishing Touches...I stamped the Gent from the Paris to London Stamp set and cut him out. I then adhered him to the inside of the door onto the text paper. 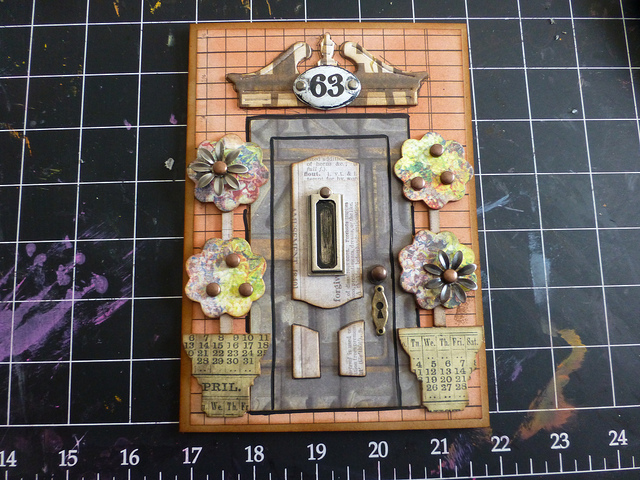 For the tag, I applied Vintage Photo ink to the swirled text again and stamped the background of the tag. 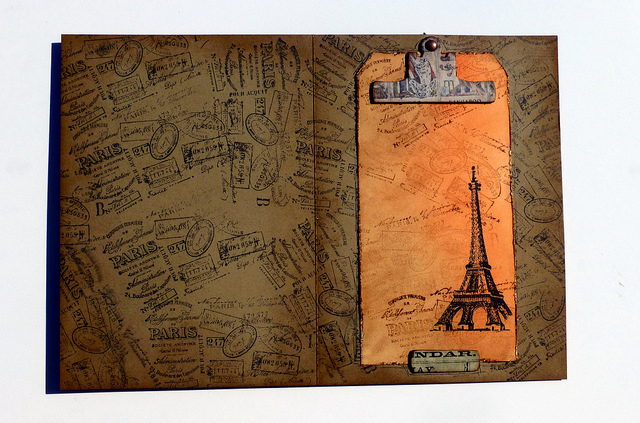 Last, I inked the Eiffel Tower stamp from the From Paris to London set and stamped it on the tag as well. That's it! I honestly had a blast making this card! Hope you like it and give it a go! Knock knock. Who's there? Jim. Jim who? Jim who always manages to knock my socks off! That's who. This is beyond cool. I'd write more, but the dryer is buzzing at me and I have to get the clothes out so I don't have to spend the rest of the day ironing. Now THAT is a fun card--wonderful details! I love a man who knows himself so well...and creates another wonderful card.I think the topiary pots are my favorite part and I love doors.Go outside and enjoy! Jim, this card is AMAZING! I love everything about it, I can't believe the labels die turned into a flower pot, I would never have thought of that. I love the door die, so cool. Have fun playing in the yard, I wish I could, were getting more snow right now. What a fun card!!! I LOVE it!! I know what you mean about feeling the need to be outside...it's beautiful today! I love seeing all the new growth and the leaves and flowers coming out on the trees. I've spent the afternoon making the box bottom for my Nell's Card Organizer...waiting for the paint to dry so I can get the paper on it and finish it up. I LOVE the card organizer...something I will actually use...thank you so much for teaching me how to make it!!! Wow Jim the Card is Great you are such an artist......It amazes me how you just whip up these things, Lovely card...and then I went to the bottom of the page and I had to look at the Spider ......Good God, that would freak me out if I saw a Spider of that size anywhere near my house. I know that was an older post.........Gives me the creeps.........Do you see stuff like this often where you live?????? I love it! I don't have those dies... I see a few more things to add to my wish list! Wow... Spring already... here in WI it's still snowing, tonight it will 1 degree... what a difference! I hope you have fabulous weekend! Say "Hi" to Cesar!!! Great card. Love how you always magage to use dies in different ways such as the labels for the flower pots. Always get so much inspiration from all your details. Thank You. Love the door! So good to see other ways to use these rather conventional dies. Sorry I will miss tomorrow, but I am sure you will create something wonderful. thanks as always for sharing. Love the card!!! 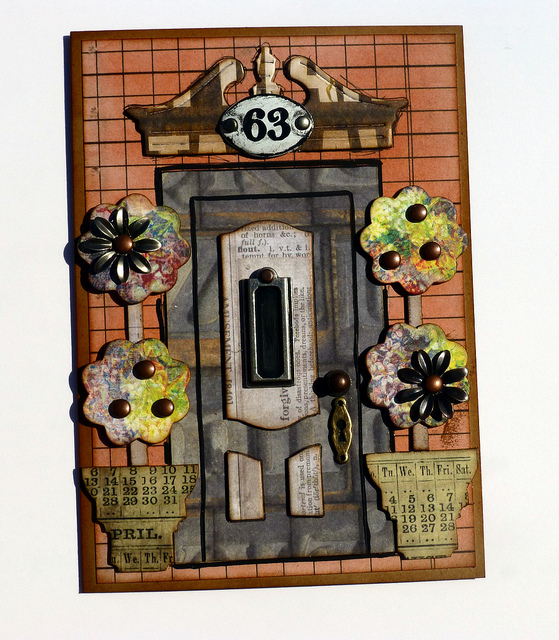 Such fantastic ideas in how to use the dies, I love the new clipboard die! I love it! It is so darn cute! I love your use of all the different dies! Wow, this card is very artsy. Love it! I love how you turned different things into other things, i.e. the pots. Love that pediment die(I will never remember that name)from the first time I saw it. Isn't it lovely when your brain runs wild while you craft? Makes me happy! You're a very clever Gentleman Crafter. I can see you had fun with this. The trees are wonderful. I laughed with glee when I saw them. Thanks for all you do. So awesome! Love this! 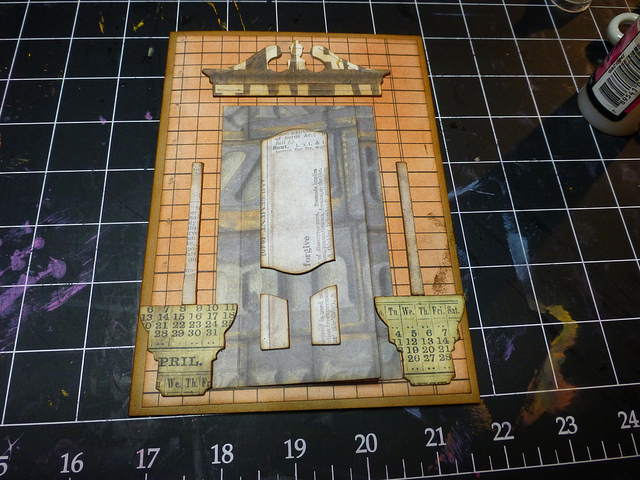 I got the Pediments die with the same idea - that it would look wonderful with the Door die, and you've proven it!